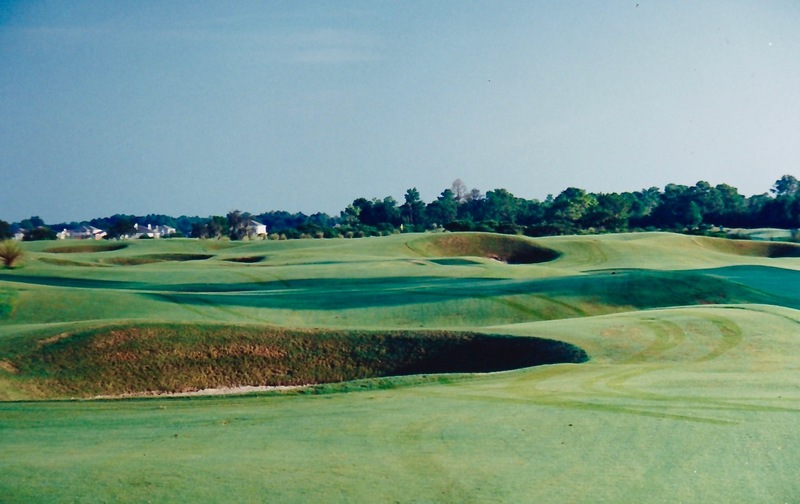 Let’s dispel with the obvious right away: no course built in Florida, on any kind of bermuda, zoysia or paspalum grass, is going to play anything like a links course. With that out of the way, the New Course at Grand Cypress Resort is an earnest and worthy ode to the Old Course at St. Andrews. Ground contour and the scuttling reaction of balls over firm seaside grass is the essence of links golf. 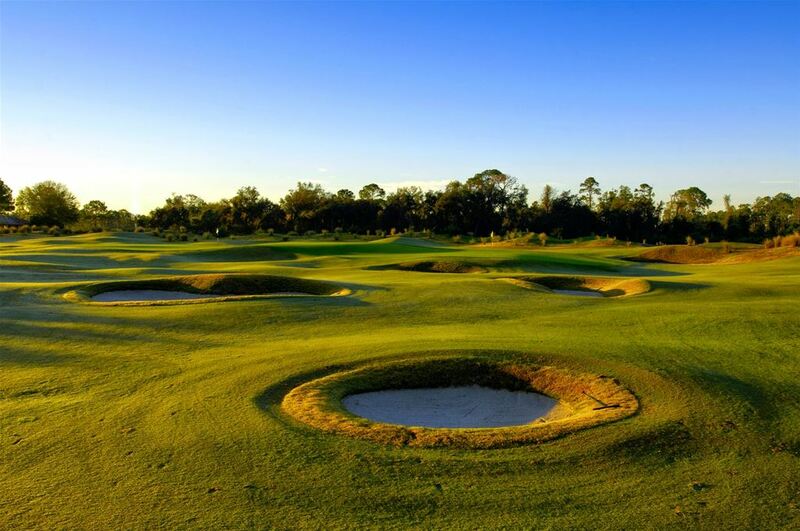 That element is not present at the New Course, but no one is claiming this is a links course and you shouldn’t be tempted to putt the ball from 40 yards off the green this close to Disney World anyway. 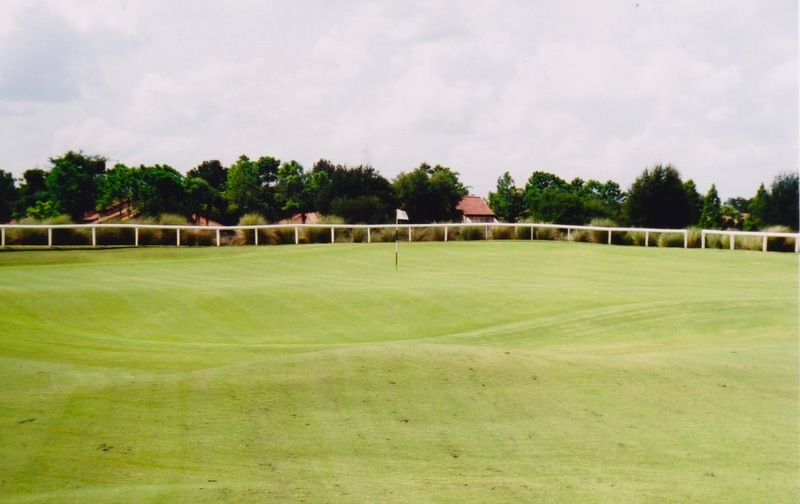 Built on former orange groves near the amusements of southwest Orlando, the course’s primary feature is space. As with the Old Course, there’s tremendous lateral forgiveness but the trick is to position drives to avoid the dozens of small, deep bunkers peppered throughout the design. That’s tough to do since they swarm the fairways like meteor storms. The key to playing here — as is true at St. Andrews — is to identify the locations of these bunkers, many of which are hidden from view, and decode the proper line to the green depending on ability, wind, flag position, etc. The ball isn’t going to roll like you might envision, but the gently churning fairway contour and haphazard placement of the bunkers forces a strategic approach to the 2- and 3-shot holes. The exception are 1 and 18, which mimic the original bunkerless couplet that share a fairway over 130 yards wide and includes a bern crossing the front of the 1st green. As with the 6th, players must determine how aggressively to play their second shots to circumvent these bunkers at the par-5 2nd. If the turf can’t deliver auld Scotland, other elements do better. The New Course presents visual ambiguity, a sense of “what am I looking at” that’s familiar to those who’ve played the Old Course. The queues from the tees are vague and you often don’t know what’s ahead until you get there. The holes are iterations of St. Andrews spirit rather than replicas (the par-5 15th, however, is a pretty direct version of “Long” with a Beardies-infested driving zone, rock wall border and, father up, Hell bunker that could have been built with a little more ferocity, while the par-3 7th, “Eden,” looks the part, and would play the part if the green speeds better accentuated the back to front green slope), but the large double greens present a flavorful approximation of the size, approach angles and contour of their inspiration. The front wall of the “Hell” bunker at the par-5 15th was likely softened for resort play, but it could stand to be a little more intimidating along the lines of the original. St. Andrews, after all, is a public course. The most interesting part of the layout is a broad field in the northwest corner containing interlocking holes 5, 6, 13 and 14. 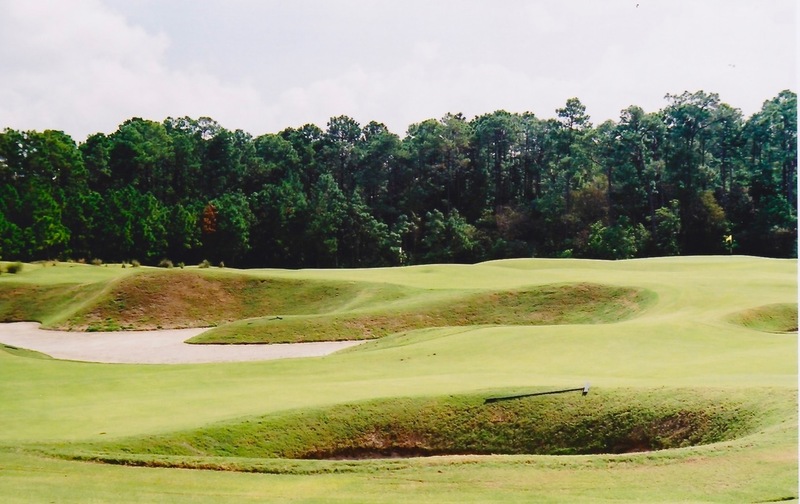 It’s essentially an enormous contiguous space studded throughout with bunkers where it’s possible to play two “fairways” over if desired (or if extremely wild), with nearly unlimited flexibility and playing angles. Missing are the thrilling, short par-4’s from the middle tees that can be pitch and putt holes at St. Andrews when playing downwind. A 270-yard par-4 (or two) for middle tee players would add diversity since in Florida a 370-yard hole is going to play like a 370-yard hole almost no matter the conditions. The 18th lacks The Royal & Ancient Clubhouse as a backdrop, but it does have an effective Valley of Sin short left.